The Legend of Zelda is great. And if somebody compared your game to Zelda, then you'd be pretty happy, no? No? While he is a Zelda fan, Darksiders II Creative Director Joe Madureira apparently doesn't want his game, with its dungeon-based gameplay, compared to Zelda. That's understandable, I guess — he wants Darksiders to have its own identity. Though, if everyone comes up to you and says your romantic interest looks like a supermodel, you should be happy! 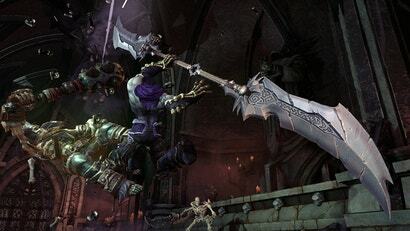 "I'll be curious to see who we're compared to this time, but the only game we want to be compared to is the original Darksiders," Madureira told Official Nintendo Magazine. "We want people to say it's like the first one but 10 times bigger and better." I really need to play the first, which I only bought because I heard it was "just like Zelda." The formula is the same - the story and gameplay is cooler than Zelda has been for quite some time - and I've played them all. I may have grabbed the original from the bargain bin but once I booted it up I didn't put it down until I was totally finished with it. So if 2 is even half as good it will be a day 1 purchase for me. I got the demo on XBL and it seemed pretty boring to me. Was the demo a bad example of what the game is all about? I've said this before. Darksiders is more like Soul Reaver than Zelda. This is another Zelda right? I heard Link gets a whole new attire in this one: Purple. Asking people not to compare things is asking them not to be human, frankly it's a stupid comment, it's what we do, it's how we work. I played this game before I heard it was supposed to be "like Zelda" and got annoyed at how much like Zelda it was...ruined the game for me. So if you don't want people thinking it is "like Zelda" don't make it like Zelda. Seriously. Even down to the sound design.